... Well, things have been a little quiet this week. I haven't had a chance to do any sewing this weekend, or this week for that matter. I'm now in Grafton, where it's humid, and a bit depressing, and it's a long story with an end that hasn't happened yet. Last weekend, however, I did some more work on my Vogue 8667 dress. I finished the hemming (or rather, I started the hemming...), and for the first time I used the little hem jiggy on my dress form, which, sadly, was one of the most exciting things that happened. 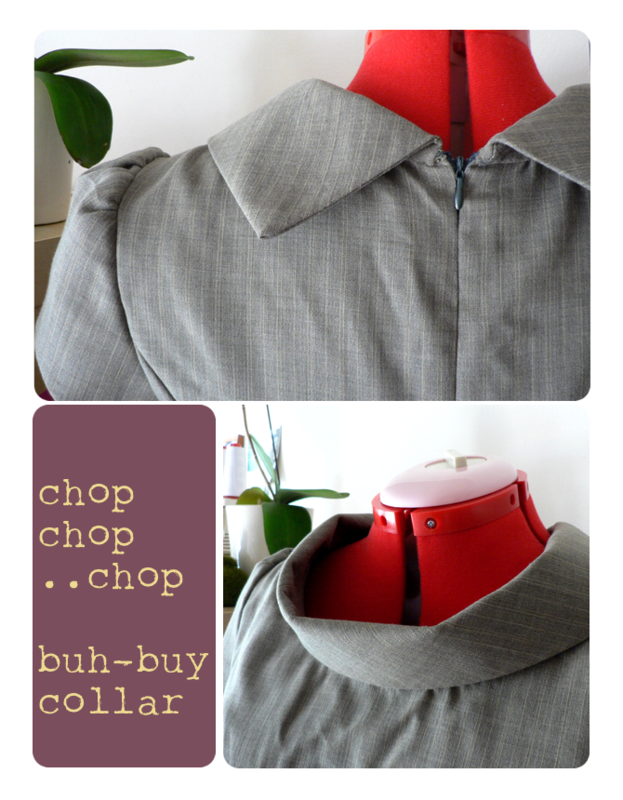 I set the collar, too. I set it and it involved rather a lot of hand-sewing. I set it and it doesn't look the way I'd imagined it would. I'm going to chop it off. Partly because I didn't realise that the back makes it look as though the collar has been accidentally sewn on backwards, and partly because it is Too Big. As in like.. makes me feel as though I'm being strangled. It's disconcerting to say the least. I'm kind of pissed because, as I say, I had to hand-sew the damn thing on, plus I spent about 30 minutes pressing it, and now I don't like it. I don't want to waste the hand stitches though, so I'm going to unpick the back and trim it down to about a centimetre wide, and.. sew it again. Much, much smaller this time. Live and learn. It's becoming a catch phrase.